On a trip to Peachtree City the other day, I noticed a new natural and organic grocery store, Sprouts Farmers Market, has opened since I last drove that route. Of course I had to stop by and check it out since such stores often have great new teas and tea products. 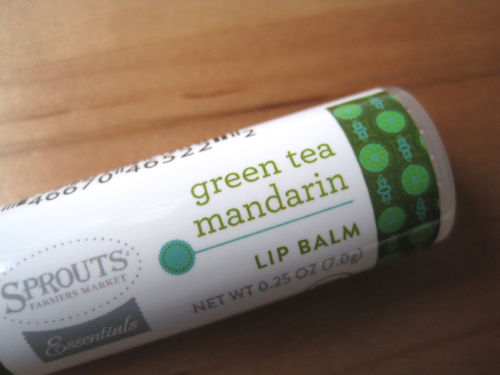 This time, it was a store brand of Green Tea Mandarin Lip Balm that caught my eye along with several new teas. 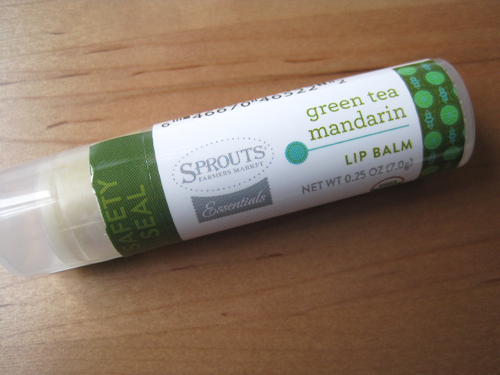 I don't know about you, but I can never have too many lip balms at this time of year. I keep them in my desk, purse, all coat pockets, the car … you get the idea. So when I saw a new one in a tea flavor, that was a must-have item. 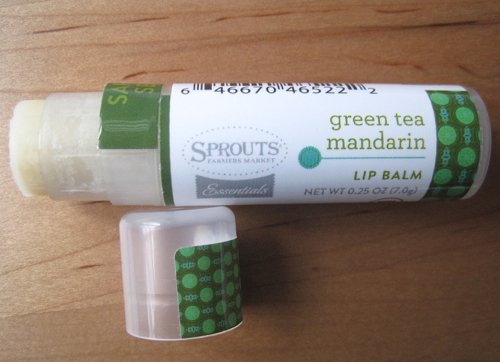 The lip balm has a great flavor, but best of all it has a light texture that feels moisturizing but not waxy like some lip balms can be. Do any of you have a Sprouts near your home? I think I just became a fan! It is always fun to me when I receive as a gift something that I had wanted but resisted buying for myself. Do you ever find that happening? 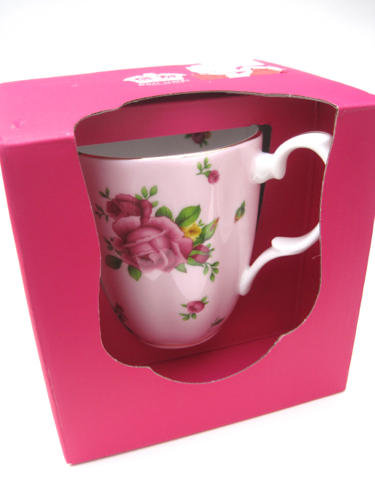 I can't tell you how many times I've picked up this New Country Roses pink mug at T.J. Maxx over the last year or so, but I always thought no, it's too expensive and you don't need one more tea mug. But when my stepdaughter and family visited for Thanksgiving and handed me a bag containing Christmas gifts, I was delighted to find this among the goodies inside! I love all these "New Country Roses" variations on the classic Old Country Roses pattern. 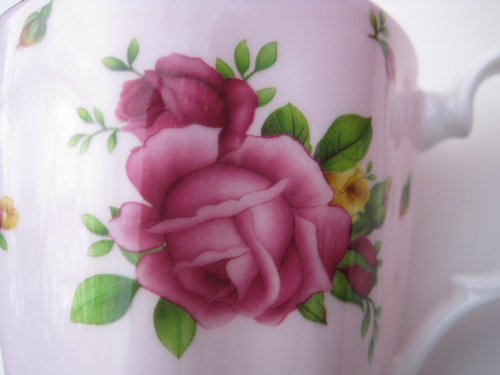 Old Country Roses was my mother's china pattern, and there's a reason it's the best-selling dinnerware pattern in the world. Oh, those lush roses! Since it was a Christmas gift, I plopped a bag of Twinings Christmas Tea inside and enjoyed a mug full of this yummy tea, which of course tasted even better in such a pretty new mug! I don't shop on Black Friday, but my aunt and I went shopping on Saturday, and I was pleasantly surprised at how very uncrowded it was at the shopping centers in Rome, Georgia. I have been looking and looking for new Christmasy tea things — teawares, tea infusers, tea giftwrap, ANYTHING — but I've come up short. Have you? 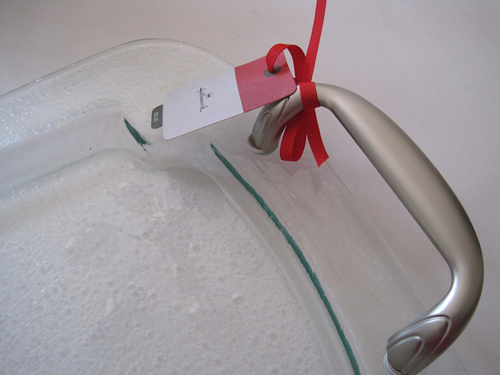 But I did find two practical and inexpensive items that you might like to know about. 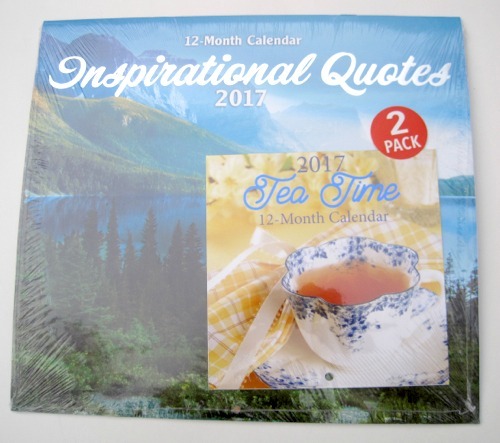 First, I had read on the Afternoon Tea Across America Facebook group about these 2-for-1 calendars at Dollar Tree. 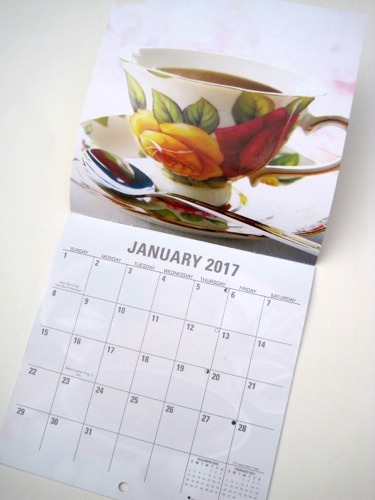 Yes, they're flimsy things, but hey, even a flimsy teacup calendar for $1 is still a bargain in my book. Besides, I like to hang one of these small-size calendars on my refrigerator using magnets, so the lighter the weight, the better. 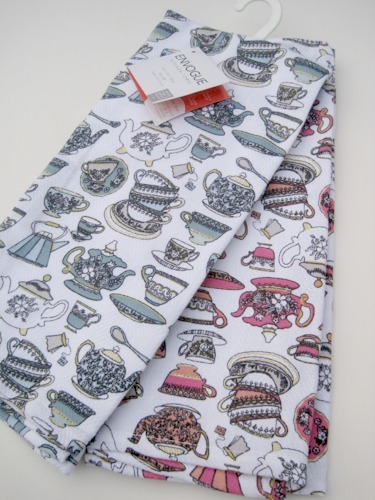 And at T.J. Maxx, I found some of the cutest heavier-weight tea towels I've seen in a while. These aren't terry cloth, but they're thicker and heavier than the flour-sack type of towels. 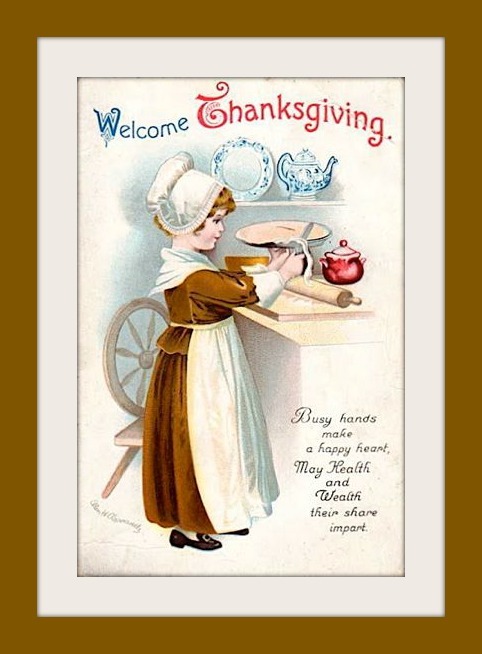 And one thing I discovered while preparing my Thanksgiving meal this year was that I can never have too many good, thick tea towels, since I go through a ton of them while rinsing off the turkey plates, cooking, and cleaning up the kitchen. Isn't this design charming? It was $5.99 for the set of two, and I looked through all the towels, thinking I'd nab a second set for a giveaway, but alas, it wasn't to be found. 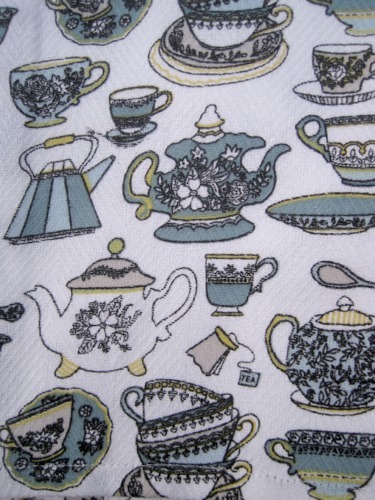 You may want to check your T.J. Maxx, though, if you like these tea towels as much as I do! Washington is a state that's famous for its coffeehouses, but happily, it appears that there have long been some tea lovers in Washington as well. 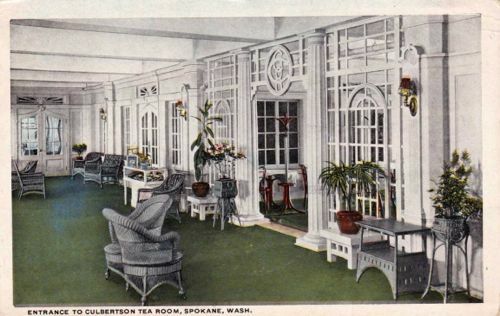 • The Culbertson Tea Room in Spokane, Washington, was the place to dine for ladies shopping at Culbertson's Department Store. I don't really know much about Culbertson's, and an article in the Spokesman-Review said only that "Culbertson’s, which carried everything from furniture to groceries, was deep in debt when the Depression hit and went into bankruptcy in 1930." That may be, but the place sure looked swell at the time this postcard was sent in 1919, didn't it? 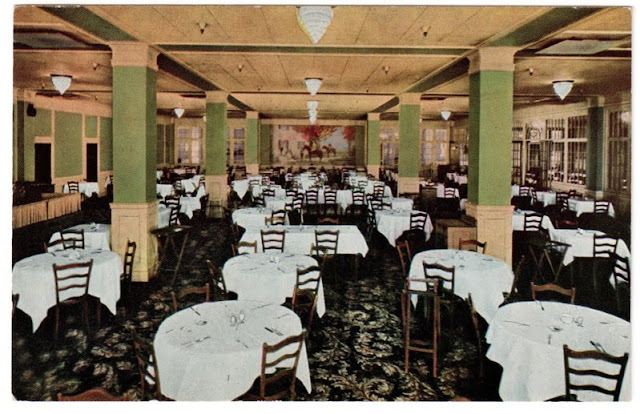 The sender of the postcard called this tearoom the "best place in the city to eat." 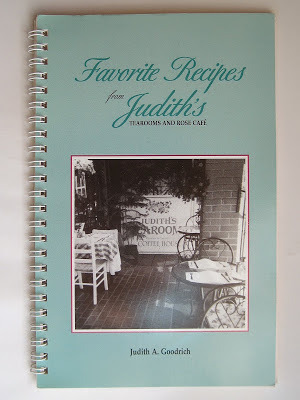 • Judith's Tea Room and Rose Café once was a favorite of tea-goers in Poulsbo, Washington. I learned of the tearoom when I found this cookbook on eBay years ago, and I was inspired to make this soup as a result. It doesn't appear that this tearoom is in operation any more, but I enjoyed finding that another blogger shared her memories of this Washington tearoom (and a delicious-sounding cake recipe) here. I meant to take photos of all the food, drinks, and desserts yesterday but, as so often happens when we entertain, I got too busy and forgot about it! 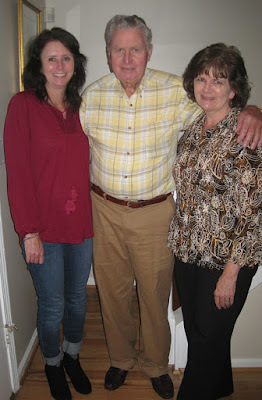 So instead, I thought I'd share a few pix from my family's Thanksgiving celebration this year. 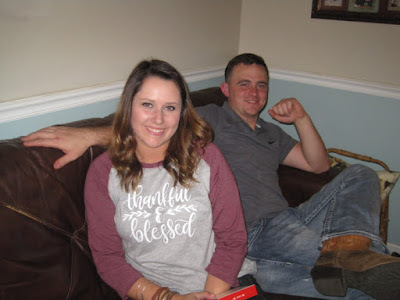 In addition to Alex and myself, we had Daddy, Aunt Jane, my sister, Rhonda, brother-in-law Brad, and their children, Madison, Cari, Matthew, and Amelia, and Madison's boyfriend, Dylan, who was nice enough to take a photo of all of us when Amelia said she wanted a photo with everyone in it. 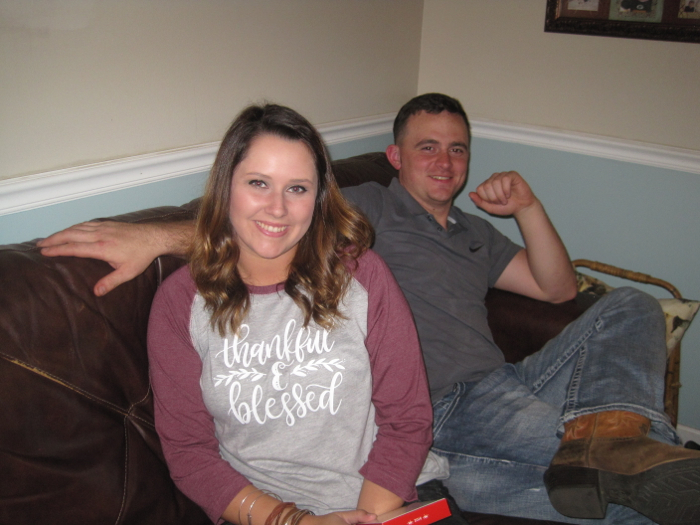 Some of you who have been reading this blog for a while have pretty much watched my nieces and nephew grow up! 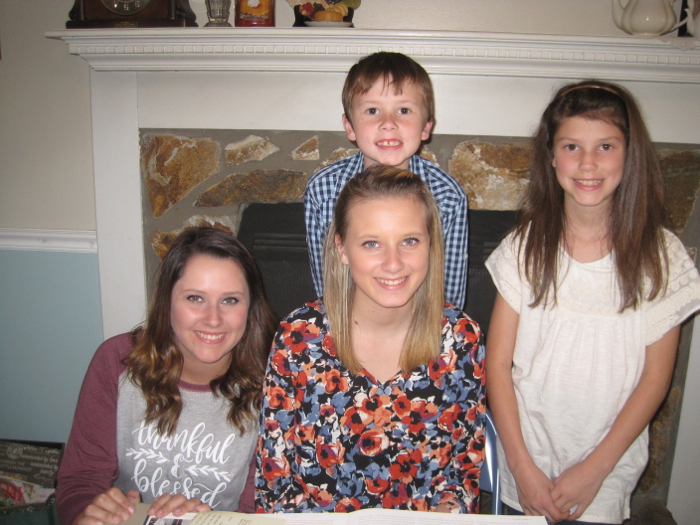 Here are Madison, Cari, Amelia, and Matthew. 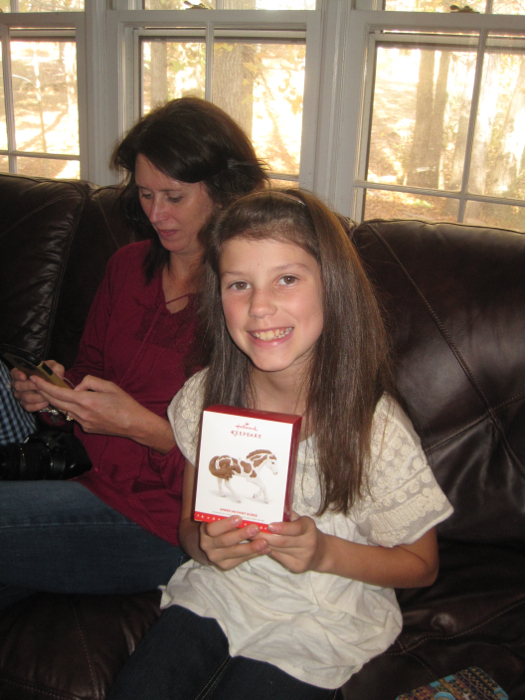 All the kids in our family get a Christmas ornament on Thanksgiving. 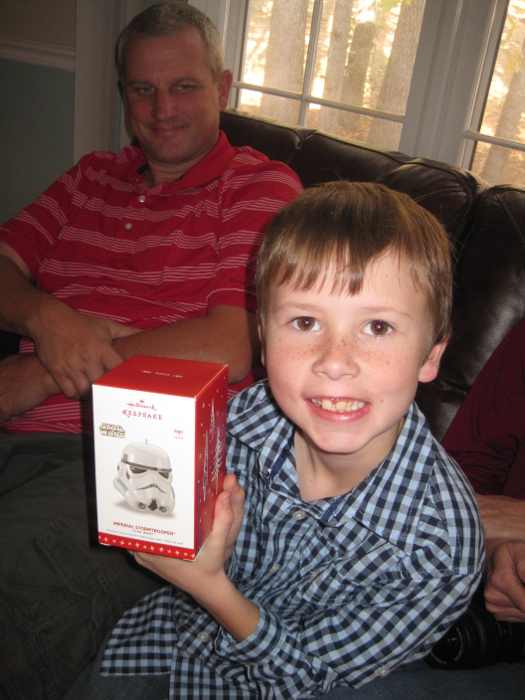 Matthew got Star Wars. 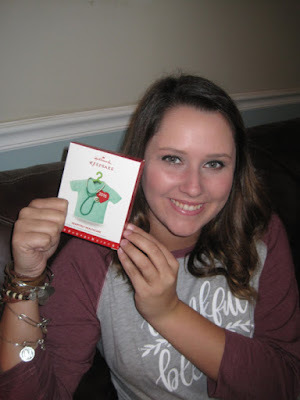 And Madison is currently studying for a career in the health care field, so this ornament seemed fitting for her this year. Here she is with boyfriend Dylan, who was a good sport about taking and being in all the photos. And here's my frequent shopping partner that you often read about, my Aunt Jane. 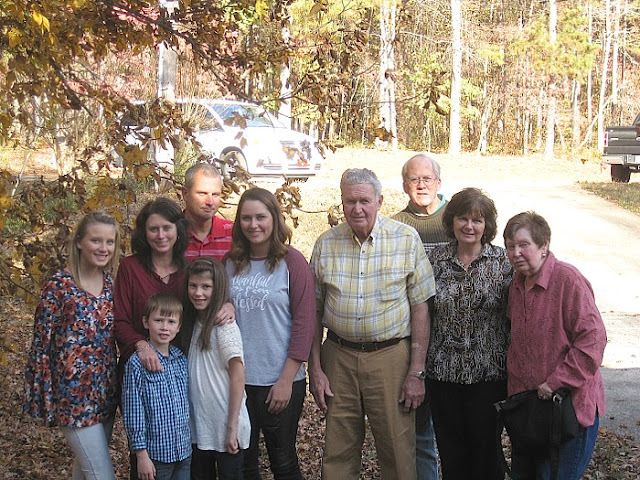 A beautiful day, a wonderful meal, and the blessing of family — it doesn't get much better than that! 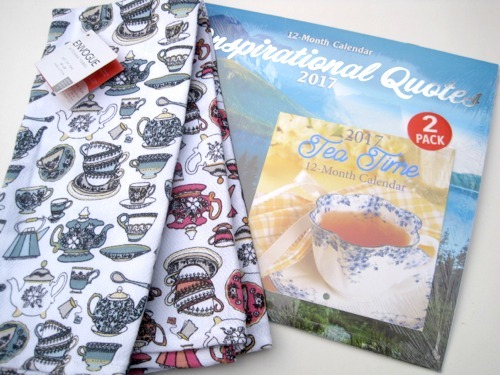 You just never know what you'll find featured in the new Upton Tea Quarterly. 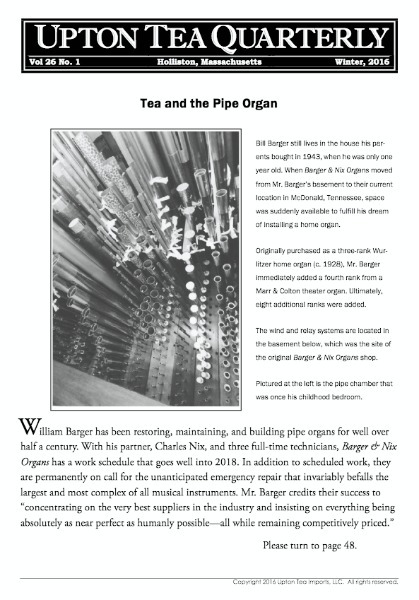 The Winter issue landed in my mailbox this week, and I was intrigued by the title "Tea and the Pipe Organ." I couldn't help thinking of my tea-lover friend Joy, who is a church organist, when I saw this article. The piece tells about a man who has been restoring, maintaining, and building pipe organs for more than 50 years and how his business became a success by focusing on quality. It also discusses the quest for "concert hall sound" in a home sound system, all of which I found intriguing, but I kept thinking, "What does this have to do with tea?" The writer—and there's no byline on the article, so it's unclear who that is—soon got to it with this: "Besides the freedom to enjoy music at any time of day, a home sound system accommodates personal preferences that are impractical with most public performances. 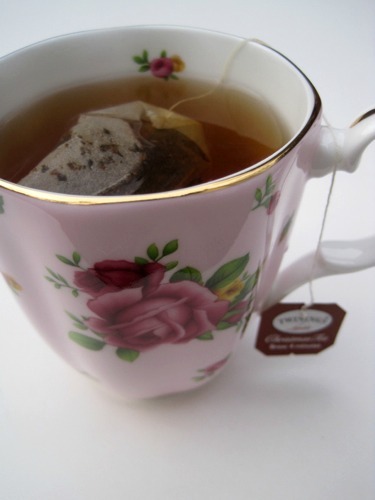 For the writer, that personal preference includes the combined tea and music experience." The writer goes on to say, "Good music, accompanied by a great cup of tea, has been a passion of mine for roughly half a century. My interest in music spawned in the 1960s, about the same time that I became interested in tea." The discussion of good music was a welcome subject and took me back to all those enjoyable Music Appreciation classes in college. I found the article a departure from the usual feature story in the Upton Tea Quarterly, but I quite enjoyed reading about quality organs and quality tea! If you'd like to read the article for yourself, click here. You never know if you don't ask, right? 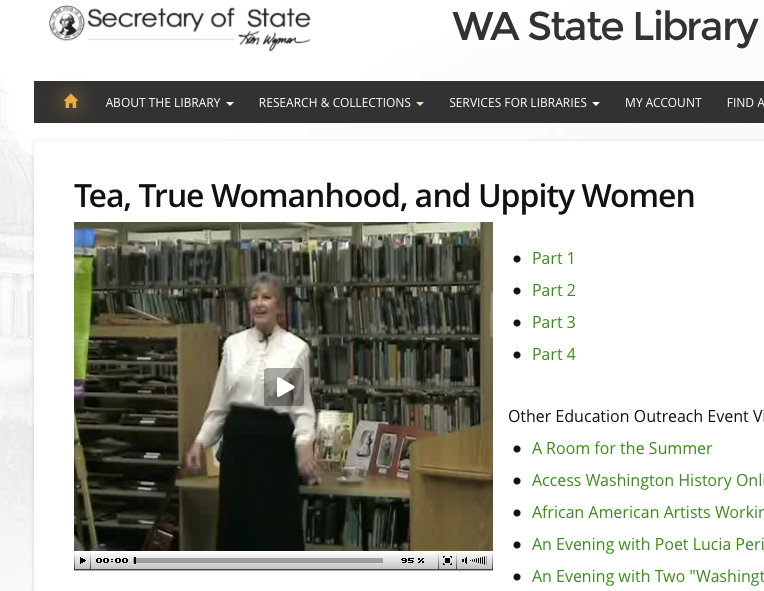 That was my theory when I recently typed "tea turkey" as keywords into the Library of Congress search engine. 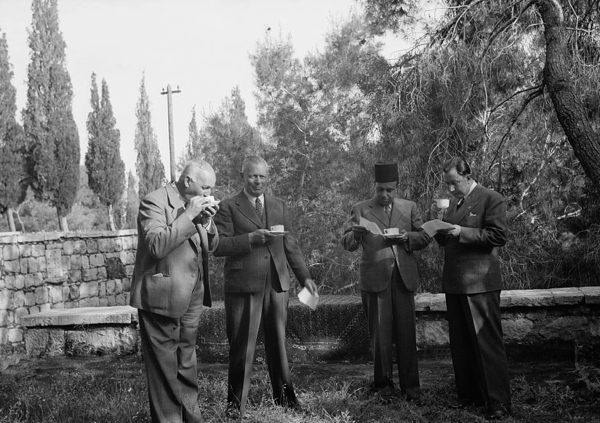 One of the photos that popped up, of four men sipping tea, caught my eye. Here's what the LOC site says about the photo: "Title: Reception by the Director of Programmes, Palestine Broadcasting Service. Tea being served, right to left: Turkish Consul Gen., Egyptian Vice Consul, Mr. Bailey, Ruhi[?] Bey." 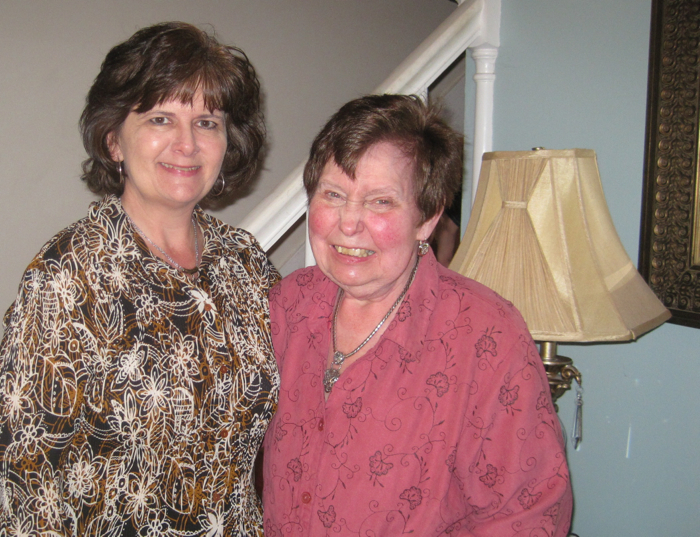 The photo was contributed by a photographer for the Matson Photo Service. There is also a note that says, "Caption continues from catalog: (Garden party at McNair's, Katamon, April 20, 1940)." It's not quite the sort of "turkey" photo I was looking for this week, but it's certainly intriguing! I read a very helpful new book over the weekend that I thought might be of interest to some of you as well. It's called "Cookie Molds Around the Year" by Anne L. Watson, and she gives great, in-depth advice for using every variety of cookie mold I've ever heard of—and a few I hadn't—during each month of the year. I have two shortbread pans I have used to make molded cookies with varying degrees of success, and this book gave me some great ideas for getting these pans to work more successfully. I also have a couple of those ceramic cookie molds (here's the one I've used to make teapot-shaped cookies), and I believe I'll use these with more confidence in the future thanks to the tips in this book. Watson also offers tips on how to know when cookies are done (by the time they're brown, they're probably overdone) and how to achieve a perfect shape with your cookies. 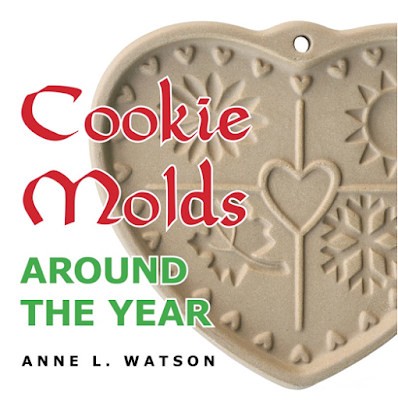 "Cookie Molds" includes lots of yummy sounding recipes, including a few that sound perfect for us tea lovers: Chocolate Coconut Tea Cookies, Cookies for Quilters' Tea, and of course, all of the shortbread cookies. There's a helpful list of cookie mold vendors at the back, so if you're inspired to seek out more molds, you'll know right where to turn. If you're a fan of molded cookies and would like to know how to make yours even better, I definitely recommend you take a look at this highly practical book! Note: I received a digital review copy of this book from NetGalley. My knowledge of Virginia is quite limited, having visited only once, years ago when I was a journalist and attended the famed American Press Institute in Reston, Virginia. I enjoyed mingling with the journalistic bigwigs there (especially some editors from the Washington Post and the Detroit Free Press, as I recall), but the main thing I remember was the inside of the conference hotel—which probably isn't the best place to get an accurate image of any city or state. So instead, I found a few tea tidbits to give me a better idea of Virginia's history. • Hot Springs, Virginia, is legendary for its waters, and President Thomas Jefferson visited for three weeks in 1818 to enjoy the hot springs there. 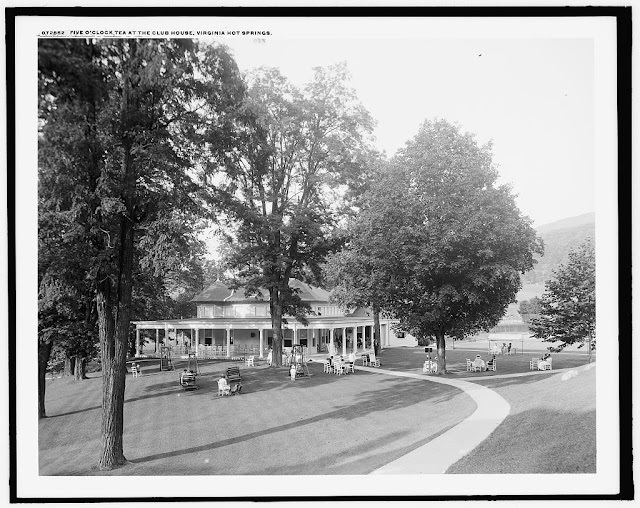 This image I found on the Library of Congress website, circa 1910-1920, shows "Five O'Clock Tea at the Club House, Virginia Hot Springs." Doesn't that look like a beautiful place to enjoy tea? 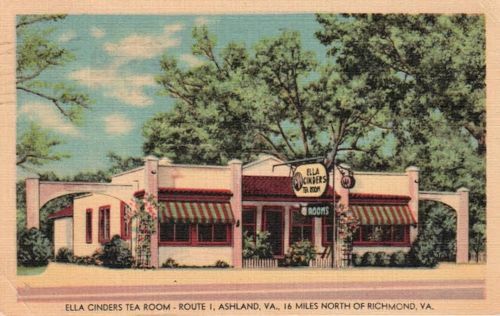 • Another charming Virginia tearoom was the Ella Cinders Tea Room in Ashland, Virginia. This old postcard is dated 1947, and the back of the card tells us what sort of establishment this was: "Recommended by AAA for past nineteen years. Delicious balanced meals served in an atmosphere of quiet refinement. Ultra modern Guest rooms, Private baths." I like "quiet refinement," don't you? And those awnings would have charmed me the minute I saw them! The winner of the ornaments is Judith! 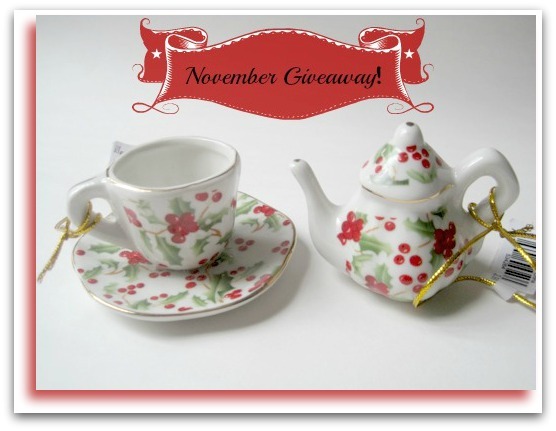 Judith at Lavender Cottage is the winner of the teapot ornaments. Thanks to all who entered the giveaway, and stay tuned for a Christmas giveaway coming up soon! 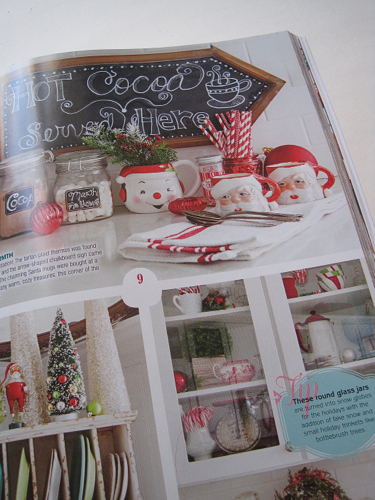 I have been reading the most delightful Christmas magazine this week, and I thought some of you might enjoy checking it out as well! 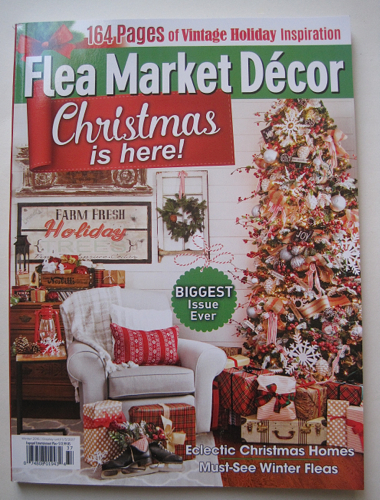 It's called Flea Market Décor, and since it was 164 pages, I didn't mind (too much) paying the $12.99 for this catalog-sized magazine. I have a rule when checking out a new magazine. I flip through it, and if I don't find at least three different pages that "wow" me, I move on, because I know I have better magazines waiting for me at home. 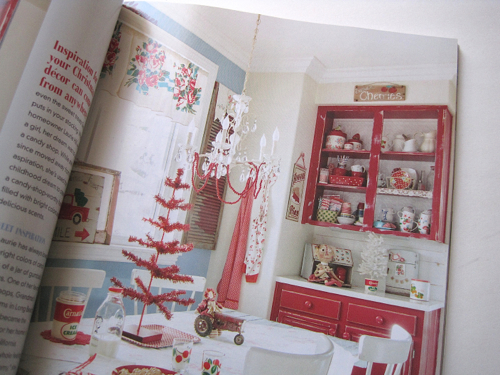 This one had me "wowing" at lots of pages, including this one with Christmasy décor in shades of red and white. Doesn't that look festive? And I do believe those cups in the cabinet look like some of the Cath Kidston patterns I admire. This very week, I was plundering through boxes of Thanksgiving and Christmas decorations and came across a silver bride's basket similar to the one in the photo above, and I was pondering what to do with it. Donate it to Goodwill? Find a new use for it? After seeing this photo of a basket with vintage ornaments inside, I'm pretty sure I know what I'll be doing with my basket this year! 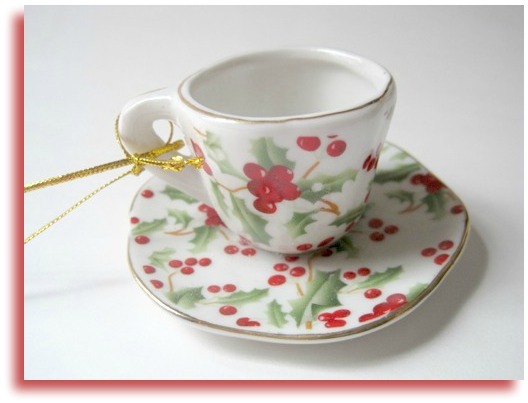 You know, those of us who collect teawares always have a head start in decorating, don't we? I mean, really, what a treat it is to already have so many silver and glass and china pieces we can use in our vignettes, and never is this true more than around the holidays. 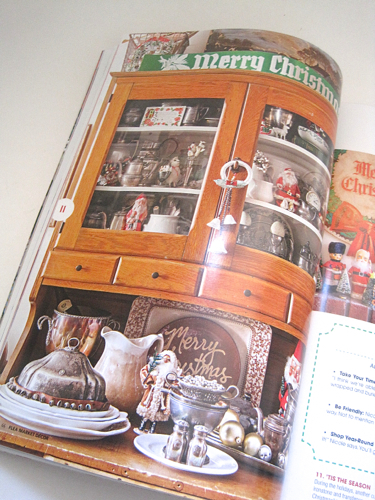 I had already been thinking of incorporating some old silver pieces into my holiday decorating scheme this year, so when I saw this cabinet with old Santas and old hotel silver and white china, I was smitten. 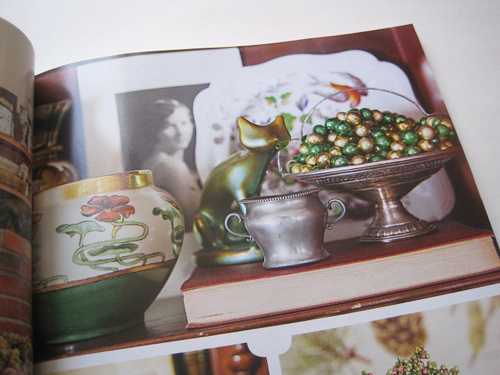 I'm happy I'll be able to use some of my old department store tearoom silver in the Christmas décor this year! And those of you who've been reading this blog for a while know of my fondness for Santa Claus mugs, so naturally I was drawn to this photo with Santa mugs on display. I also liked seeing how pretty the candy canes look in milk glass, especially since the new Pioneer Woman collection at Walmart features lots of that pretty white glassware. So if you're looking for some decorating inspiration for the weeks ahead, I do believe you'll find some in this great new magazine! A new tea tray that I got for free! I should have mentioned this sooner, but Hallmark is having a special Holiday Open House through today, November 17, and if you spend $100 or more, you get a free 18-1/2 x 12-inch tea tray. They call it simply a "tray," of course, but to me, a tray is always a "tea tray" because "tea things" always end up on it! 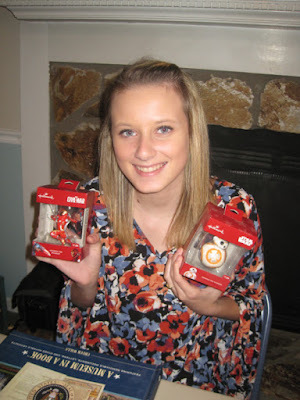 Last Saturday happened to be the day I'd scheduled to go to the Hallmark store at the mall to buy all the Christmas ornaments we give grandkids, our nieces, and nephew at Thanksgiving each year. When I checked the Hallmark brochure I got in the mail, I was delighted to discover that after purchasing eight ornaments featuring Star Wars, Batman, Captain America, a Madame Alexander doll, etc., I would qualify to receive a nice freebie for myself. 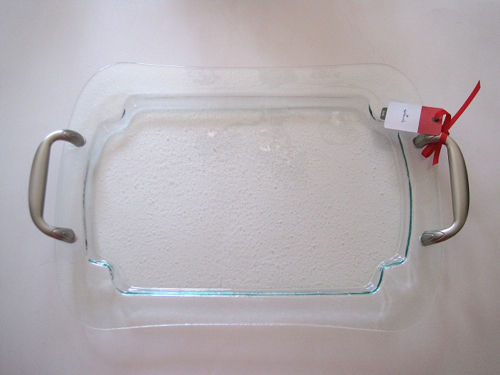 I signed up to bake brownies for my Sunday School class Christmas party, and I think this will be the perfect tray to take them on. I've been pinning things to Pinterest in hopes of baking something unique, brownie-wise. 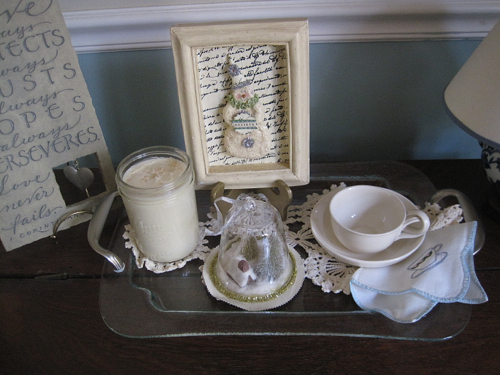 I must confess that originally I pulled out my "winter whites" for the new tea tray, but I couldn't quite bring myself to have Christmas decor out before Thanksgiving, so I changed it. 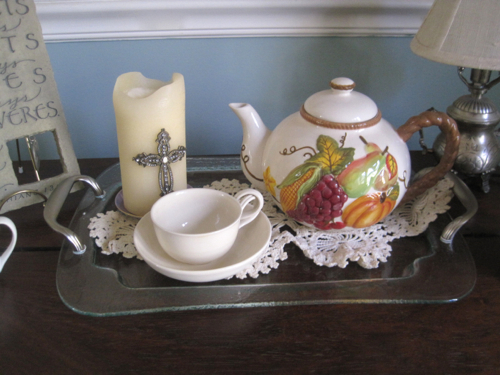 And I may change the new tea tray up again before Thanksgiving gets here! 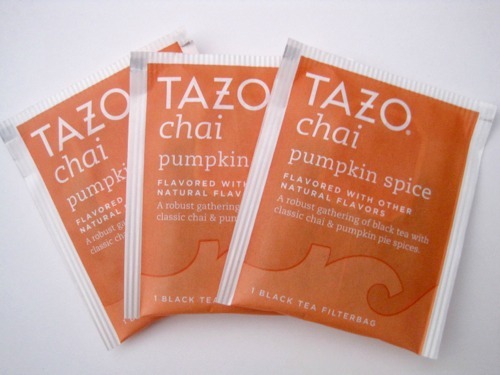 Earlier this year, I tried Tazo's Chocolate Chai, and at Kroger this week, I passed by an aisle full of Thanksgiving foods and discovered this Tazo Chai Pumpkin Spice. 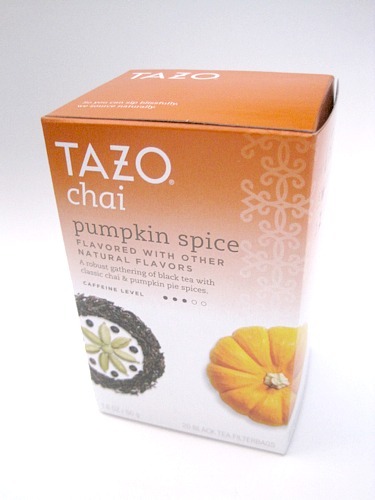 Since I'd really like to try every pumpkin-flavored tea in existence, this one with chai sounded most intriguing. As usual, the tea bags are individually wrapped, a feature I always like. I give this chai-pumpkin tea a hearty thumbs-up! The chai flavor pairs quite well with the pumpkin flavor, and it was a nice switch from the sweeter, more dessert-tea-ish pumpkin teas I've sipped lately. 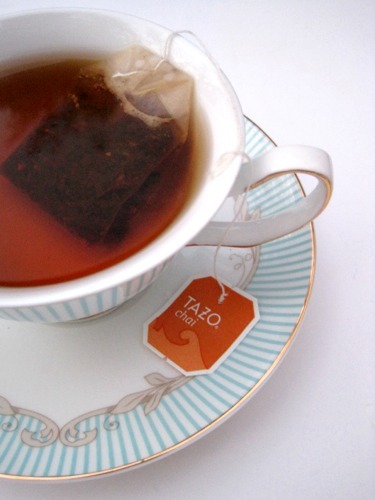 I haven't been a huge fan of Tazo's teas in recent years, so I'm glad I decided to give this one a try! 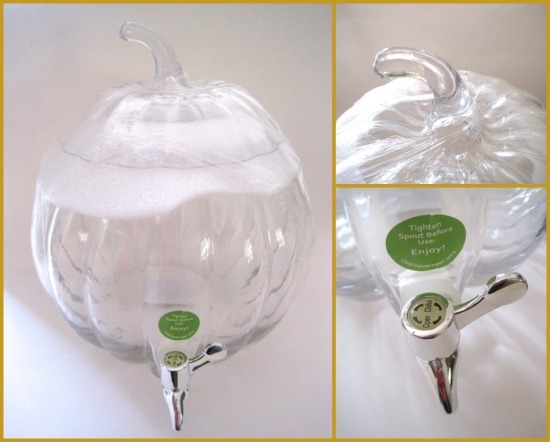 I'm really going to have to figure out how to shoot decent photographs of clear glass so that I can properly share some images with you all, especially of fun finds such as my new Pumpkin Beverage Dispenser, a bit of glassware I was surprised to come across at Walmart! (I haven't even taken the plastic wrapping off mine yet.) I will be serving lots of sweet tea over the Thanksgiving week, as we're hosting family twice and maybe even three times, so I feel completely justified in spending the twenty bucks (well, $19.84) that this cost. I actually saw it at Walmart in Carrollton two weeks ago, but I was in a hurry that day and didn't want to go get a buggy to wheel it to the front. I'd run by my local Walmart back home and grab one later, I thought. Except that the Walmart I went to last week, the one in nearby Peachtree City, didn't have these, and when I asked the associate there about them, she wasn't familiar with them. So … on my next trip to Carrollton, I headed back to their Walmart, and they still had plenty of these on hand. Finding one had become a slight obsession by that point, as I can just envision fall tea parties where tea or tea punch is served from this pretty pumpkin. 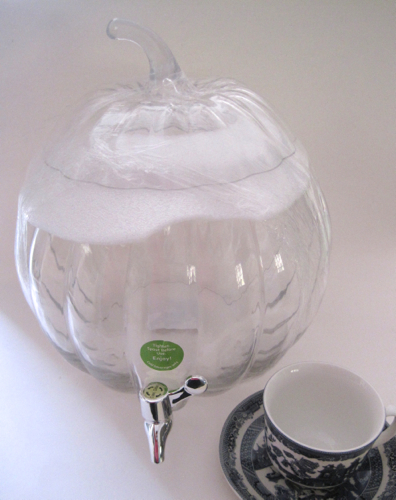 (I put a teacup in the photo to show its size next to the 2.75-gallon size of the dispenser.) The Walmart website shows these as out of stock, but the Carrollton Walmart still had plenty, so if you're interested, you may want to check your local store no matter what it says online. A similar dispenser is available from the Sur La Table catalog here, for a few pennies more, in case some of you are interested. I can't wait to use mine! 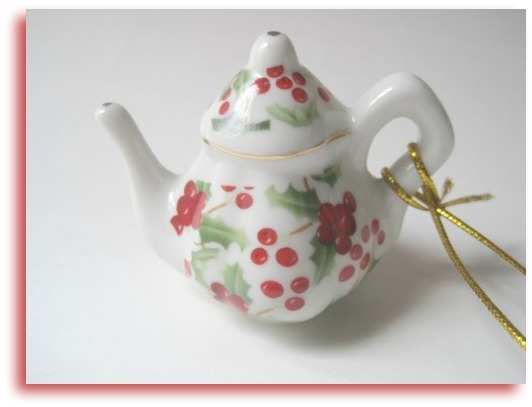 Ah yes, it's that time of year when I go looking for new teacup and teapot ornaments! A friend alerted me to these at Cracker Barrel, so I decided a set of two would be fitting for a November giveaway since some of you early birds are no doubt getting ready to put up your Christmas tree this month. No matter what your Christmas decor, I'm betting a teacup-shaped ornie with holly and berries could find a home *somewhere* in your decorating scheme this year! And the teapot ornie is charming as well! If you'd like to be entered to win, just leave an "Enter me" to this post between now and 7 a.m. Friday, November 18, and you'll be entered to win. (US and Canada only, please.) Good luck! Vermont. Hmmm. What do we know about Vermont? It's the home of maple syrup, Ben and Jerry's, and the famous Vermont Country Store. But does Vermont care for tea? • The historic home where the Vermont Constitution was framed and adopted in 1777, the Old Constitution House in Windsor, was originally a tavern, later a tearoom, and today is a site that's on the National Register of Historic Places. 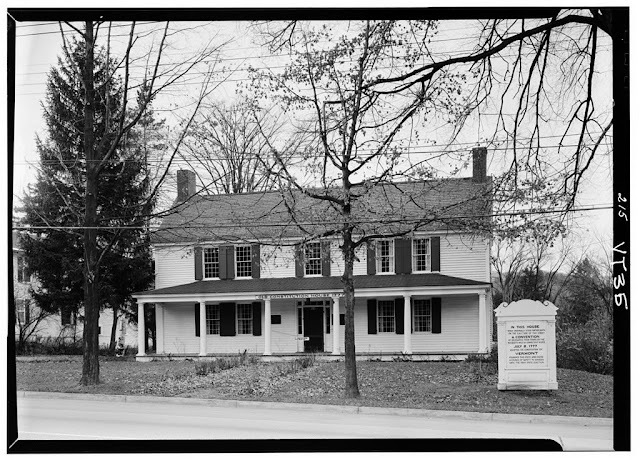 According to a Vermont state website, "The Old Constitution House features period rooms that reflect its use as an early tavern. A large interpretive area in the early 20th century tea room examines the events surrounding the signing of the Vermont Constitution. The collection at the Old Constitution House contains many pieces donated by area residents and the local chapter of the Daughters of the American Revolution.” Sounds like a great place to visit if I'm ever in Vermont! 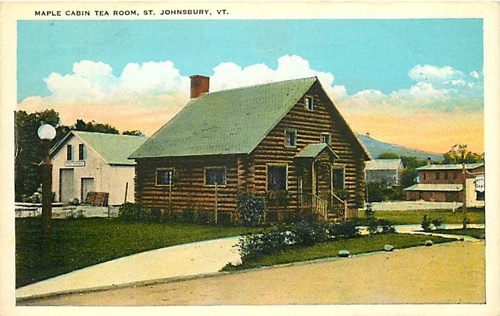 • This vintage postcard from my tearoom postcard collection shows the Maple Cabin Tea Room in St. Johnsbury, Vermont. I'm glad that at least one tearoom in Vermont had "maple" in the name, and no, I wasn't crazy to associate maple syrup with Vermont, which, it turns out, is the nation's leading producer of maple syrup. (I love maple syrup. And maple candy. And maple-flavored teas. You get the idea.) I also love that this tearoom, shown circa 1941, looks as if it were made of Lincoln logs. 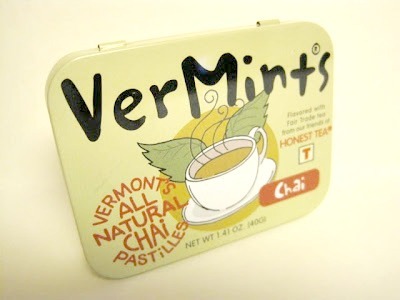 • Perhaps one of the most clever tea products to be associated with a particular state is "VerMints." I first came across these Vermont-made mints years ago and have seen them in quite a few stores since that time. According to the history on the company's website, "Born in the Green Mountain State in 2000, VerMints began humbly on a stovetop in a small kitchen in Bellows Falls. The goal from the get-go was simple: Make a simple and true mint. All flavor; no funky stuff." You can click here to find out where your closest retailer is.